Stephen Starr’s new book on Syria is full of startling insights that only someone who has lived and worked there for the last five years could write. It is also a good read. Here is an excerpt. Laila met me at a café in downtown Damascus. She was from a wealthy family that lived in Dummar, a suburb on the north-western outskirts of Damascus. She was twenty one years old and in her third year of media studies at Damascus University. I suggested that they were probably afraid of civil war in Syria. Laila disagreed. She told me how on 15 June, on the day of the unfurling of a giant Syrian flag in the Mezzah area of Damascus, she had an exam at the nearby faculty of literature. “I had to take off my shoes to cross the street because I couldn’t walk on the flag in order to get to my exam. Then when I started the test I couldn’t concentrate because of the noise from the rally outside. I mean, what type of logic and thinking is this – to hold a huge govern¬ment rally next to a state university where state exams are tak¬ing place? It is just so stupid. Sipping on a lemon-mint drink, Laila was convinced Syria was being held back by those in power. “We have to work all year to spend one week in Beirut for some fun. What is this? Beirut is nothing, we could have so much more right here in Syria,” she said, bending marks into her drink¬ing straw in frustration. Laila said she has been once or twice to Beirut for shopping and to visit pubs and that her closest four or five friends all shared her opinion on ‘The Situation’. She also told me of the mafia-style workings of the police and security apparatus as the regime worked to stamp out dissent across the country in July. For Laila, as for others, corruption and the necessity of wasta are hated aspects of daily life in Syria. Corruption and bureau¬cracy angered her most. “If I want to get a passport in Jordan it would take me one hour. In Syria it will take forever unless I pay the employee some money. She went on to talk about the business situation in Syria and the anger it made her feel. “Do you know how they started Syriatel?” she asked me, refer¬ring to the telecommunications company owned by the presi¬dent’s cousin. “Anyone who wanted to open a mobile phone line had to pay 10,000 Syrian pounds and then wait for months. Then they bought the equipment and technology they needed and started their own company. What rubbish! This is the peo-ple’s company. Those people did not pay for it yet they call it their own. She told me about the reasons for social inequality in Syria. “The people who live in 86, the Alawites who have free phone lines and who don’t ever pay for their electricity, are being told they are going to be attacked and are being given guns by the security forces ‘to protect themselves’. “We have laws but no one obeys them. Why? Because they are not being enforced. People are flexible. If the government leads with a bad example the people will follow. I asked her whether it wasn’t the responsibility of the people not to do this, not to give out money to the police and other government workers and not to throw litter in the streets. Laila said she was neither an activist nor part of the opposition beyond posting cryptic remarks on her Facebook page. I asked her for the solution to the current unrest. ‘Revolt in Syria’ was released in the US on August 14. The sight of Hillary Clinton cutting a rug on the dance floor this week in South Africa gives away the moral obtuseness of America’s chief diplomat. That image will tell the people of the besieged Syrian city of Aleppo, under attack by a merciless regime, all they need to know about the heartlessness of U.S. foreign policy….. These are the words of someone running out the clock on the Syrians, playing for time on behalf of a president who gave her this post knowing there would be at Foggy Bottom a politician like himself instead of a diplomat given to a belief in American power and the American burden in the world…. On the subject of local governance and organizing committees, this article from last Sunday (12 August) in LeJDD explains how a new civil society is springing up in Northern Syria where Assad no longer rules. (Reuters) – Russia warned the West on Tuesday against unilateral action on Syria, a day after U.S. President Barack Obama threatened “enormous consequences” if his Syrian counterpart used chemical or biological arms or even moved them in a menacing way. Russian Foreign Minister Sergei Lavrov, speaking after meeting China’s top diplomat, said Moscow and Beijing were committed to “the need to strictly adhere to the norms of international law…and not to allow their violation”…..
“We have been very clear to the Assad regime, but also to other players on the ground, that a red line for us is (if) we start seeing a whole bunch of chemical weapons moving around or being utilized,” Obama said. “That would change my calculus.”…. Many tragedies have followed the start of the Syrian uprising 18 months ago, but one that deserves more attention is the destruction of Syria’s cultural patrimony. Throughout the country, Roman temples, Crusader castles and medieval mosques have been subject to shelling, gunfire and military occupation. What is more, the collapse of authority has led to widespread theft and looting. As Syria descends into bedlam, the international community must work to protect the country’s historical sites, lest we see a repeat of the destruction of Iraq’s landmarks after 2003. Syria is the cradle of civilization, with a history of human settlement stretching back 5,000 years. ….. Among the at-risk monuments is the Unesco World Heritage site Crac des Chevaliers, a Crusader fortress of the 12th to 13th centuries, which stands on a hilltop overlooking the plains of Homs. It is regarded as the finest example of medieval castle architecture anywhere in the world. According to reports, Crac was the site of peaceful antigovernment protests in March when it came under shelling. This led to damage to the outer walls, as well as the elegant Crusader chapel inside, which was converted into a mosque in 1271. Other reports indicate that it has served as a hub for foreign fighters who have entered Syria to battle the regime. Then there is the ancient city of Palmyra, another Unesco World Heritage site, whose ruins lay scattered across a desert oasis 150 miles northeast of Damascus. Looting has been reported throughout the archaeological site, including in the Temple of Bel complex, the stately colonnaded avenue, the Camp of Diocletian, and the Valley of the Tombs. Some of the most brazen destruction has occurred at the Roman city of Apamea, about 40 miles northwest of Hama. During recent months, Syrian army tanks have occupied the colonnaded street and shelled the 12th-century fortress of Qala’at al-Mudiq, which stands atop the old Roman acropolis. Plunderers have profited from the chaos, arriving in Apamea with heavy digging equipment and absconding with priceless Roman mosaics and column capitals. There is speculation that these kinds of looters are part of a wider network of criminals operating in the Middle East, who pillage archaeological sites on behalf of the black market. Some of the worst-hit monuments lie in cities that have been the focus of sustained urban warfare. These include Dara’a in the far southwest, where the uprising began in March 2011; its ‘Umari mosque— founded at the time of the Islamic conquests—has sustained heavy shelling. There is also Homs, the veritable center of the uprising, where countless mosques, churches and markets now stand in ruin. Most recently, the fighting has spread to Aleppo, where gunfire has engulfed the great medieval citadel in the center of town, which has served as a makeshift army base. There are dozens of other examples of destruction throughout the country, not to mention instances of brazen theft from Syrian museums. This has prompted ominous comparisons to postinvasion Iraq, where the collapse of security led to much-publicized looting of the National Museum, along with ancient sites such as Babylon and Nineveh. With no end to the Syrian uprising in sight, what can be done to reverse the trend? First, the media and nongovernmental organizations must publicize the damage and looting. …..
God willing all of Syria will be liberated from this scourge of the enemy of humanity. All claims to alleged successes by the thugs of the regime are false and mere posturing. These idiots think they can win the war by simply spreading propaganda and lies. Bashar has defected and formed the Brigade of Free Animals. He dubbed it as BBFA. He said he wants to dispel any rumors that he is a thug or a dictator and that he detests the idea that others are monopolizing the use of the term Free. The ‘Shabiha’ gladly joined in mass and felt completely at home and pleased, especially with the idea that animals too can be Free. They are now based in Zoos (no pun intended) that they call Free Zoos of ‘Love-You-For-Ever-Die-For-You-Always-Free-Pets-At-Last’. Syrian regime authority Jamil Qadri have shown open to any option including the renounce of Assad as President, during a press conference in Moscow after meeting russian Foreign Minister Lavrov. I am smelling the cooking of Assad …. the begining of the end of the end. حظرت ميليشيا الجيش السوري الحر تعذيب الأسرى أو قتلهم، وذلك بعد الانتقادات التي وجهها محققون للأمم المتحدة اليها بعد الجرائم التي ارتكبتها العناصر التابعة لها بحق المدنيين والعسكريين السوريين. I would like to hear from anybody who believes this statement,you can not bring a sheep back to life after you slaughter it,allowing thugs and Islamists to infiltrate what was supposed to be a decent popular movement that wants to save civilians was an unforgivable mistake,Syria is paying for it now, I will consider the FSA part of those thugs until they start fighting and arresting them instead of joining them in this fatal dance. That’s not going to fly. Athad must step down. No negotiations are possible with criminals. In addition, Athad and all involved in crimes against the Syrian people must be prosecuted and receive proper punishment. A deal without accountability is no deal. the problem is an irreconcilable difference between the baath government and the syrian peasantry. The syrian constitution states that government security is immune from syrian law. The peasantry demands an end to lawless government. The baath refuse. because they do not know how to rule without fear. so now we have a civil war on our hands. The real meaning of the Syrian civil war is whether or not the nation of Syria belongs to all of the people or just the ones with guns. Fouad Ajami is the only one who makes sense. More than a month into the battle for Aleppo, the rebels who seized control of much of the city sense that its residents do not yet fully support them. Opposition fighters – around 3,000 of them – are almost the only people moving around the eastern half that the Free Syrian Army now controls. The small numbers of non-fighters who remain seem to pay them little heed. Few seem openly welcoming. comment: this is what I said from day one,Aleppo is being punished by the rebels,not liberated, the line here about rebuilding the city after it gets destroyed is rather criminal. Israeli officials said Tuesday that Egypt is violating the historic 1979 peace treaty between the two countries by deploying tanks in the demilitarized Sinai desert near the Israeli border. The officials said they have relayed their objections to the Egyptians directly and through American mediators. An Egyptian border official confirmed that his Israeli counterparts had voiced concerns. Egypt has been building up its military presence in the lawless area since Islamic militants there attacked an army post on Aug. 5 and killed 16 soldiers. Rebels say 70% of city is with regime. My 2 cents: being not with the revolution does not mean being with the regime. These 70% are not with the rebels just because of a survival instinct. It us understandable. As the sun set on the first day of Eid al-Fitr marking the end of Ramadan on Sunday, Sheikh Abu Sleiman visited a mosque in the north of the city and took up the microphone. “I told them that we understand their suffering,” he said. “We are sensitive to their needs and we know that this has been a major disruption. And that when we finish, Aleppo is theirs.” The sheikh’s words echoed from a minaret in a rebel-held district across residential streets long since deserted. “We have enough challenges already,” said a rebel commander in the north of the city. “These people will give us all a headache. We need to prove to the people that this revolution will work. ارتفع عدد قتلى الاشتباكات التي تجددت في مدينة طرابلس شمال لبنان بعد ظهر يوم الثلاثاء، الى ستة واصابة 70 شخصا بجروح مختلفة، بحسب مصادر أمنية لبنانية. وذكرت تقارير امنية تناقلتها وسائل الاعلام اللبنانية، ان “الاشتباكات المسلحة بين منطقتي باب التبانة وجبل محسن في طرابلس، تجددت بعد عصر اليوم رغم اعلان اللقاء الاسلامي الوطني، الذي عقد اجتماعه بحضور عدد من السياسيين في المدينة الى جانب ضباط من الجيش اللبناني التوافق مع فاعليات التبانة على وقف اطلاق النار فورا”. I like this forum despite having to see pieces like the one in post # 1 which you might think is taken from a Jihadist radio station. Syrian cities is being destroyed because Syrians are unwilling to talk to each other,screaming here and there will not change this fact. one has to be careful before believing what the rebels and government sources say,both have lied in the past. You know the real reason you hate #1 is because he is the only one who can expose your endless talk from the double sides of the mouth. Are you ready for the exposure? So who are you anyway? Are you a Palestinian who at one point benefited from the corrupt regime to make you so keen on defending its corruption by deceitfully speaking the one opinion and its complete opposite in one and the same sentence? Sorry for not joining the ‘bash Hillary’ festivities. Syria has already too much of a foreign intervention. Syria doesn’t need more of this. The Syrian people are doing great, and will eventually remove this junta from power. Yes, it’s very costly in human lives, but Syria is big (+-22 million) and it will recover. There were much worse civil wars in the history, regarding lose of lives. We live in a 67y/o UN world order. This world order was achieved after the bloodiest of all wars. This order gives some 5 states, the dictatorial power to veto. Even if we, at times, don’t like it, and even if we think it’s unfair, we should respect this order, and preserve it. Or we want a third WW. The Syrian people is paying the price, and it’s sad. But there’s no other alternative. The Syrian people are capable of putting this ugly junta down, by themselves. thats what the media in the west including SC is trying to teach us since 1 1/2 years. 20% for the rebelles + 80% against the rebelles = 110% for the rebelles. Also SC must accept critics. The only truth is that 5 % of syrian population has been living on behalf of the rest 95 %. Assad is your guarantee and we are going to topple him. Your mafia regime is over. If Aleppo is taken by rebels Assad will long 2 or 3 weeks. If not it can takes some months or even years. But finally the dictatorship and their supporters will fall. My suggestion is that Assad gets suicided like Ghazi Kanaan, Suleiman and other Baath fellows. توقّع رئيس مجلس الأمناء الثوري السوري هيثم المالح “اعلان حظر جوي في شمال سوريا في الايام القليلة القادمة لأن محافظتي حلب وإدلب ستكونان محررتين وسيجري منع طيران فيهما لتكون منطقة آمنة وعندها سنعود الى سوريا كمعارضين لتشكيل حكومة انتقالية وادارة الدولة والعمل على اسقاط النظام السوري”. ولفت المالح في حديث تلفزيوني الى انه “شاهد في تركيا التحركات الضخمة للجيش التركي على الحدود ورأيت نقل صواريخ أرض جو وذلك لحماية المدنيين في سوريا”. Having heard a lot of accusations and allegations against our Revolution, I wanted to apologize officially today at the Assad supporters and the world community. We are sorry that we, ordinary Syrians have gone for our freedom on the streets. Without permission of the Super Powers. We are sorry that we have thwarted your plans for Syria and that we dared to havesome of our own. We are sorry that we wanted human rights for us. We are sorry that we have exposed your lies, cold-heartedness and the hypocrisy. We are sorry that we have turned with our Revolution Uncle Bashar into a monster and we feel not ashamed for it. We are sorry that the sight of our tattered bodies arent suitable for your tv screens and your sensitive eye . We are sorry that we have asked for humanitarian and medical aid. We are sorry that we have become refugees, begging on the streets and disrupt the city. We are sorry that the blood of our children is not red enough to reach the conscience of many leftists. We are sorry that we have dared to defend ourselves after months of steady killing. We are sorry that our strive for freedom will not fit into your concepts. We are sorry that we will not accept your apology. Nadim Shehadi, a specialist on Syria and Lebanon at Chatham House, the think-tank of the Royal Institute for International Affairs in London, said Syrian television, despite a lack of credibility in its reports, is playing a highly effective role in the war. comment: do you really think the regime media is effective? obviously,some people in the opposition think that it is OK to kill journalists and camera men who work for the government because they are “shabeehas”. Der Spiegel had published some interesting hints today. They had a story in which the regimes control over the aid and relief programme was critized. Only one non state oragnization the “Syria Trust For Development” operates besides the red cross and red crescent. We all know who is behind Syria Trust For Development, its Asmaa.An employee of this trust said to the news magazine that refugees who receive food donations must make a loud verbal prayer for the deceased Hafis Al Assad. Als the dontation of food come usually by companies which are under the control of the famous Rami Makhlouf. In the last weeks the trust issued statements asking for volunteers to come up and register. many who came were later arrested, it looked like the regime was using even this way to track down rebel supporters. The European Union is investigating whether its Syrian sanctions were violated by the sale of cigarettes to a firm linked to cousins of Syrian President Bashar al-Assad, according to corporate documents seen by The Wall Street Journal. I am somewhat disappointed with Professor Landis. His article on Kurds was not meaningful. Freddo is just acting like his usual cowardly and criminal self: us or we burn the country. Crazy, what else. It is no great strategy aside from ” the enemy of my enemy is my friend ” . Lots of what passes for analyses, isn’t. I guess, your rebelles will go in 2-3 week back to the roots back to the desert. Pressure growing on Turkey and soon reaching a tipping point. Of course the intelligence report that Turkey has become a “free entry inn” because of the fire in next-door Syria and the government’s liberal “welcome to all guests” policy. Not only has $250 million been spent so far on the “guests” who are “refugees,” but they are not officially refugees because Turkey does not accept refugees from the east and thus cannot officially ask for international assistance. In this way Turkey has imported the Syrian crisis as well. Hatay and Gaziantep have been filled with agents of all sorts and become highly insecure. Worse, the Sunni-solidarity drive of the Islamist government of Ankara made Turkey a “front” in the Syrian civil war. Turkish citizens have begun to be kidnapped (in Lebanon for example). But even worse is the shift in the separatist terrorist attacks from the Iraq border regions to the Syrian border areas. Of course, a power vacuum in Iraq was one reason for the gang’s increased cross-border attacks as seen over the past decade. Now, five border towns of Syria are under the control of the local organization of the separatist gang there. The central Syrian administration has no control in the border area. Thus, the gang’s cross-border attacks have shifted to the Syrian border regions. Turkey scrambling to explain how the failure of the Turkish intelligence omnipresent in the area in preventing the bombing. They point their finger to a plot between the Syrian Mokhabarat and the PKK. Why not with Al Qaeeda too? There is a possibility the defiant Syrian regime may be behind the recent attack in Gaziantep, Turkish government officials have said, despite a lack of evidence currently at hand. (AFP) Syria’s deputy prime minister hinted at a peace deal that might involve the departure of President Bashar al-Assad. A top Syrian minister on Tuesday held out the prospect of strongman Bashar al-Assad stepping down as part of a negotiated settlement to 17 months of bloodshed that activists say has killed 23,000. The comments from Syria’s Deputy Prime Minister Qadri Jamil came following talks with Foreign Minister Sergei Lavrov and other Moscow officials who are keen to keep their sway over the Soviet-era ally in case of the fall of Assad. Jamil rejected the idea of making Assad’s resignation the condition for any future negotiations — a demand made not only by the armed opposition but also Washington and several big European states. But he said the president’s departure could be a topic of discussion. “As far as his resignation goes — making the resignation itself a condition for holding dialogue means that you will never be able to reach this dialogue,” said Jamil. MOSCOW, Aug 21 (Reuters) – Syria is preparing to complete a deal with ally Russia to secure much-needed oil products to keep its economy and military running, the head of a Syrian delegation to Russia said on Tuesday, weeks after he said an agreement had been reached. Laila is my new heroine. Someone please buy her a gun and some bullets and lead her over to the 86 area! Can Obama beare any more humiliation? What a disappointment he and Mrs. Piggy turned out to be. • The Syrian deputy prime minister responded by saying that foreign military intervention in Syria would be “impossible” because it would lead to a conflict beyond the country’s borders. Qadri Jamil, speaking on a visit to Moscow, also accused Obama of making “propaganda threats that are linked to the upcoming elections”. Russia warned against unilateral action. WASHINGTON — The United States expressed deep skepticism Tuesday about suggestions by Syria’s deputy prime minister that the regime was open to discussing Syrian President Bashar al-Assad’s resignation. “We saw the reports of the press conference that the deputy prime minister gave. Frankly, we didn’t see anything terribly new there,” State Department spokeswoman Victoria Nuland said. Deputy Prime Minister Qadri Jamil said after talks in Moscow Tuesday that Syria was ready to discuss anything in negotiations — even Assad’s resignation. “As far as his resignation goes — making the resignation itself a condition for holding dialogue means that you will never be able to reach this dialogue,” he said. Any news in regard to Farouq al Sharaa? SyriaComment accepts “critics” to a degree that has vandalized this forum. We see unrestricted postings by nasty propagandists, people with grudges and obsessionist crazies, many of them showing crude disrespect for this blog and its supporters. They get a much easier run here than on other blogs because Joshua Landis is so open and tolerant. 4. After all this regime did help kill our boys in Iraq and so it serves them well to get kicked back by their own people. 5. We have to put our house in order first. If Putin wants to pout and the Europeans are waiting for us to bail them out again forget it. So I fully understand the lack of interest and enthusiasm on the part of the US for any action in Syria. Let me call a spade a spade as well. Turkey turned out to be less of a regional power when it comes to putting its money where its mouth is. Iran turned out to be more active but has reached its limit of what it can do due to the sanctions. The Gulf Arabs are just good at dolling out cash and not much more. They still at this critical point do not have any strategy whatsoever except to decide what is for dinner. The Arab Spring will come to them and this the time table: Sudan in two to three years; KSA in about five years if not sooner; it may very well be Egyptians invading KSA to get the oil as their economy continues to suffer and the MB will not be able to deliver. UAE in 10 years as they are more liberal. Algeria in one generation. As for Syria, the regime has degenerated into a milita and is acting like a militia. Freddo is looking to leave without humiliation; if this is true, then who in the inner circle is going to let him go while they stay behind to stew. I would like the people on this forum to try to find out where the other members of the inner circle are: Mamlouk, Nasif, and the others. Now GHUFRAN and ZOO would very much like for the FSA to act according to international law and to respect human rights and to conduct itself in such a manner that in reality both should have asked of the regime forces to do. MY QUESTION FOR GHUFRAN AND ZOO: Can you in all honesty deny that the regime has used the most extreme torture and humiliation and oppression against opponents and can you honestly tell us if you do not know anyone who was not ill treated by the regime? I am not going to speak on zoo’s behalf and I am not sure we are on the same page unless you consider everybody who criticize armed rebels to be pro regime. The FSA presented itself as a clean force that was established to defend civilians, its leaders have been lecturing us about virtues including justice and tolerance,etc. look at the bahavior of armed rebels and the destruction they helped create and tell me how faithful those guys have been to their principles. As for how the regime treated its opponents,we both know the answer,you just need to read my posts to rediscover my opinion of the regime and its head. Without a cease fire,syria will be lost, then it will not matter if you are pro or anti regime,I want Syrians to be anti destruction regardless of where they stand politically,do you honestly believe that armed rebels are willing to consider a cease fire? We both know the answer . Your analysis leaves much to be desired. You have to look at the Syrian Revolution as a Syrian affair first and foremost. The main responsibility lies on the shoulders of the Syrian people. Regional and International players have their own priorities and concerns and will understandably respond to the Syrian Revolution based on those concerns. Iran and its proxies have the most to lose and therefore they plunged into the Syrian uprising the earliest. Likewise, Russia stands to lose so much especially after its bitter experience in Libya and hence it took a self defeating uncompromising position since the beginning. The US is in an election year and that is a priority for mr. Obama. But, in my opinion mr. Obama does not have what it takes to tackle the Syrian crisis despite all the geostrategic consequences that are so obvious, even if he is not in an election year. We’ll find out after November. The Turks will not move unless given the backing of NATO which is a defensive organization when it comes to threats made against member States. Turkey’s own nationalist interests may have to suffer in order to safeguard the above mentioned NATO prerogative. In addition, Turkey has been told in plain terms by Washington that there will be no military moves before November 2012 . KSA and the Gulf cannot move effectively without US backing as well. They are doing what they can do on their own in terms of providing weapons and cash to the rebels. Absent US logistical support, their contribution would remain limited at best. In short, all roads lead to the White House. Atwan thinks that a political solution may be on the horizon,do you agree ? The Guardian article is the first serious reality check after 18 months. The next one will come when the rebels will be squeezed enough to call for a truce. اعتبر وزير الخارجية الإيراني علي أكبر صالحي أن هناك اتجاهاً إلى استئناف العلاقات الدبلوماسية بين طهران والقاهرة والمقطوعة منذ أكثر من 30 عاماً، وذلك في حديث نشرته، الثلاثاء، صحيفة “الأهرام” المصرية. وقال صالحي الذي أجرت معه الصحيفة الحوار في مكة على هامش قمة منظمة التعاون الإسلامي التي عقدت الأسبوع الماضي، إن “مصر هي حجر الزاوية في المنطقة وهي الدولة التي لها مكانة خاصة وموقع متميز بين الدول العربية والإسلامية، هي ضاربة بجذورها في عمق التاريخ تربطنا بها أواصر المحبة والصداقة والإخوة”. Salihi gave the title of Qalb Al-uroubah Al-Nabed to Egypt, this title used to belong to Syria ,Salihi needs to give Syria another title before Arabists in Syria get a heartburn. I don’t expect anyone to “behave” in a war. Even the countries who called themselves ‘civilized’ and supposed to be models to the world behaved like animals when they were being attacked and threatened. War is a place where the worst on human being comes out. This is why all should be done to avoid them, and if not, to stop them by pushing for negotiations and not by arming the antagonists to fight in more wars. It is clear to everybody that the rebels fights are pointless, they will loose sooner or later. Why continue? for the honor? for martyrdom? Is it worth hundred thousands death? It is clear that the regime is weakened and will be obliged to negotiate reforms and transition under the pressure of Russia and Iran on which the whole economical and political survival of the country is dependent. So, why wait for more dead and put conditions before starting the negotiations? I count exactly two sects in that paragraph, and Christians are practically non-existent n Jordan. Blatant propaganda, King Hussein must be pleased. “The young, unemployed Christians in Damascus responded to regime appeals to take up arms to defend themselves,” says a local priest. “They were told Salafists were coming to kill them,” a reference to ultraconservative Sunni Islamists who are a growing influence on Syria’s uprising. The young Christians were urged to join what the government has named “Popular Committees”, which are tasked with protecting neighbourhoods from attack. To many, however, they are just groups of pro-government thugs. Some Popular Committees – like those in Bab Touma and the neighbouring Christian area of Bab Sharqi – have even agreed to be armed. Most Christians, who make up about 10% of Syria’s population, have sought to avoid being drawn into their country’s increasingly sectarian conflict, which has seen the majority Sunni community bear the brunt of the crackdown from security forces led by Alawites, members of a heterodox Shia sect to which Mr Assad belongs. Some Christian opposition activists have reached out to members of the rebel Free Syrian Army (FSA), and both have tried to reassure the community that they will not be targeted. In one of the suburbs of Damascus, al-Montasir Billah Omar, a spokesman for the FSA’s al-Baraa bin Malik Brigade, met representatives of other rebel formations to write a joint statement warning local Christians not to take up arms. Our fight is not against any of the minorities in Syria, not even the Alawites, but with the Assad regime”. “We call on our brothers in Syria to maintain the social mosaic that distinguishes the country,” urged the statement, which was signed by the Military Council for the Syrian Revolution in the Suburbs of Damascus, and other FSA brigades. لندن – كشف مصدر ديبلوماسي عربي ان امير دولة قطر الشيخ حمد بن خليفة آل ثاني مستاء اشدّ الاستياء من الرئيس المصري محمد مرسي. واوضح المصدر ان سبب الاستياء يعود الى ان امير قطر يعتبر ان مرسي لم يقدّر ما قامت به قطر تجاه مصر اخيرا عندما اودعت مبلغ ملياري دولار كوديعة في البنك المركزي المصري لدعم الاقتصاد والعملة الوطنية. على العكس من ذلك، استبعد مرسي قطر من لجنة رباعية اقترح تشكيلها على هامش القمة الاسلامية لمتابعة الوضع السوري. At the end of the day,Qatar can not change the fact that its whole population can fit in a one of Damascus suburbs with space to spare. The road to the White House is a dead end before and after November. After the plane, now the bus. Turkey evading its responsibility in protecting its citizen and looking for a culprit. Is Syria behind the Gaziantep attack? But this time Syria and its deep state, including its intelligence service, is also counted as a potential perpetrator of an attack that killed nine civilians and wounded more than a dozen. This hypothesis not only belongs to us. Hüseyin Çelik a deputy leader of the ruling Justice and Development Party (AKP) and Şamil Tayyar an AKP deputy from Gaziantep have also drawn attention to such a possibility on the grounds of bitter relations between Ankara and Damascus over the Syrian people rising up to demand democratization. Foreign Minister Ahmet Davutoğlu has cautiously joined them and drew attention to idea that both the PKK and the Syrian administration share similar world views based on the fact that both have chosen violence as a method for their political purposes. But the connection between the rise in PKK attacks inside Turkey and the Turkish government’s heavy engagement in Syria is undeniable. In the last two months the PKK has intensified its attacks against all sorts of targets, including kidnapping a lawmaker, launching attacks in western parts of the country, targeting civilians in different towns and more. That was the reason why the pro-Kurdish Peace and Democracy Party (BDP) urged the government to review its Syria policy, an obvious hint that the attack could have been carried out by some Syria-affiliated groups. Though we have no concrete information on the extent of the cooperation between the PKK and Syria, it would be a surprise to all of us to see a full detachment between the two. Nearly one third of PKK members are of Syrian origin, a country which has had traditional relations with the organization since the late 1980s. Turkey’s leadership in international efforts to topple the Bashar al-Assad regime has obviously caused the opening of Pandora’s Box in the Middle East. The current picture tells us nothing, but a more unstable Middle East provides the best conditions for a terrorist organization to spread out its acts. And Turkey, unfortunately, is amongst the architects of this shape with its short sighted policies. أكدت مصادر سعودية أن هناك بذور انشقاق ينذر بانفجار داخل صفوف جهاز الحرس الوطني السعودي ، ويخيم على هذا الجهاز توتر شديد خاصة في بعض القواعد العسكرية بالمنطقة الشرقية من المملكة. وقالت المصادر أن هذا التوتر جاء على خلفية رفض فرقة من الحرس الوطني بالتحرك لقمع تظاهرة سلمیة ضد حكم آل سعود خرجت يوم الجمعة الماضي في العاصمة الرياض. ويأتي هذا الرفض من جانب الفرقة العسكرية المذكورة بعد أن كانت شاركت قبل اسبوع في عمليات قمع تنفيذا لأوامر عسكرية عليا، مما دفع مسؤول القاعدة العسكرية الى استدعاء الفرقة الخاصة في الحرس الوطني من اجل التعامل مع هذه الحالة تحت بند “العصيان وعدم تنفيذ الاوامر”. وأكدت المصادر أن سبعة من كبار ضباط الفرقة التي امتنعت عن تنفيذ الاوامر بالخروج لقمع المحتجين تم اعتقالهم، وهم الان تحت التحقيق والتعذيب. How do you think the Saudi regime will respond if the situation in the East gets worse? The point I was making is that for an AVERAGE American there is no point in intervening in Syria that is why the Obama administration can pontificate while leaving the country to descend into chaos. The second point I would like to make is that IF NEGOTIATIONS ARE TO BE STARTED THE REGIME HAS GOT TO PUT THE GUN AWAY AND NEVER EVEN THINK OF USING IT. There can be no negotiations while the security services and the militia are left to run around and to use force. The use of force by the regime forced the people to take up arms. The regime calculation is that with violence they can recreated the 80’s narrative and crush the opposition with the fear of instability keeping the majority at home. Well the majority was already left with no choice but to ask for change as the regime had already destabilized the country and left people without hope of a better future. The situation is not similar to the 80’s. Now for those that want to avoid any further destruction, I would propose that the army returns to its barracks and that the FSA and the local people create a volunteer police force at the local level to maintain a minimum of order and then negotiations can start about a true transition regime. I fear that a Lebanon style outcome is what we will have and we will replace one super thug with a multitude of local thugs like Geagea and Aoun and Jumblatt and what have you. We are in for a long dark hard road, yet I do believe that the most resourceful and resilient and practical people on earth will rise to the occasion and pull through with a new regime. The shrinking of US power has allowed for local regional players to come to the fore, yet none of them is even close enough in power to affect more than a very limited influence in the region. This the end of US hegemony and the beginning of local regional exhaustive rivalry. If it is true that the brother is severely injured or dead, the mother has now only two children left. How much more can she risk for the sake of this futile power struggle? How much longer will the others wish to retain power when Freddo leaves for Moscow? Now the next step as I read the news is the sacrificing of Freddo for the sake of preserving a minimum of regime structure to allow for Iranian and Russian interests to be preserved. So we are in a salvage operation by Russia now. Let us what the delivery room of Putin’s Russia will give birth to. I am not holding my breath. DO YOU ALL REMEMBER CONDI RICE TELLING US OF THE BIRTH PANGS OF A NEW ME IN 2006 ONLY TO HAVE HER NOSE PUSHED IN THE DIRT OF SOUTH LEBANON? Will the masculinity of weapons defeat the femininity of peace in Syria? Edleb countryside – Anyone visiting the northwestern Syrian city of Saraqeb these days is bound to notice the graffiti that says “the Revolution is female.” Any observer is also bound to notice large groups of men – both armed and unarmed – wandering around. There are men going about their business or manning Free Syrian Army checkpoints, but no women at all. When I ask him about women’s role apart from supporting military action, he answers that this is war and that women have no place in it. In the “liberated” territory, which is ruled by weapons, women’s role seems limited to supporting men, as women are all but absent from protests, which are already of rare occurrence. Coordination committees, media centers, army barracks, local police forces and cadres of the self-administration authority created by local residents are of a predominantly masculine character. I look for women in Saraqeb, Bansh, Atma and Telaada and the answer always comes as follows: Women belong in houses and the streets are for men, it is war. Many media reports addressed the role of women in the popular movement and were frequently published from the start of the revolution until recently. These reports highlighted the essential role played by Syrian women in most regions, which included organizing protests and taking part in them, organizing communication and media action in general, as well as taking part in relief and humanitarian action. This role was clearly manifested in major cities, but it was also apparent – though not as obvious – in the countryside and the most marginalized of regions. Female Syrian activists operating inside the country and abroad left a female mark in supporting the revolt on both the peaceful and military levels. Newsrooms, revolutionary action on social media platforms, civil and political gatherings and media forums seemed filled with a female presence, and women succeeded in imposing themselves as men’s equals. Why is the image of liberated Syria so different from Syria under the revolution then? Your comment is a typical menhebkji rant and quite frankly I wouldn’t have expected more from such as you. For then I would be giving too much unwarranted credit for a menhebekji level of thinking. basically, you’re saying we see no evil, hear no evil every thing is normal while the house of cards is crumbling upon your head and your idol prethident. What I am saying is that the Syrian people have the means on their own to achieve the objectives of the glorious revolution and crush your idol-prethident. Now the envoy to Ankara may say the US is not planning a Syrian invasion and yet that will not change any of the above facts. It will not even change the facts that we know full well that the US military does have contingency plans for military action in Syria that may or may not involve boots US or others on the ground. It will also not change the fact that plans for creating NFZ’s over Syria are already in the pipeline by other NATO countries and they would only require tacit US approval to come into effect. By the way we haven’t seen any US or NATO troops in the Libyan scenario. So, if I were you I would stop looking at the world in this oversimplified rosy picture that would always fall in accordance of the wishes of your die-for-always idol idiot. Also, a time may come when Turkey may decide to go alone as it may see its own national interests getting jeopardized to the point that makes such move unavoidable. You only need to recall the Ocalan affair to know what it took for your idol to cower down and swallow an ignominious defeat in front of the whole world. ZOO, that’s an interesting statement of what you believe (#43). But tragically, your dream of avoiding war by negotiation has zero relevance or reality in Syria. The DNA of the Assad regime makes it fight to the death to avoid losing a drop of power and privilege. Otherwise things in Syria would not, COULD not have come to this. And what the hell would Russia and Iran care about or contribute on reform and transition in Syria? Or the political and economic survival of the country? They both have dirty, unstable backyards themselves. And are preoccupied only with screwing themselves into blind contortions about losing face against the west. The fact that you even ask what the rebels are fighting for and state their cause is “pointless” reveals to me that you have not absorbed and understood what has happened inside Syria. 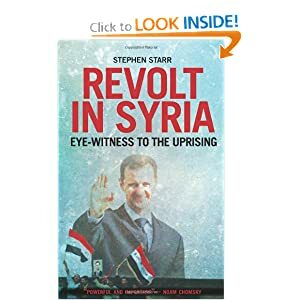 The corruption and chaos mentioned in that excerpt from Starr’s book posted above should have been straightforward to start reforming – but not for the Assad regime. They have shocked the world and made history with their country-burning, murderous resistance to compromise and change. Thank you OBSERVER for your statement in #50 pointing out that nothing can ever change until the regime puts away the gun and never thinks of using it again. Plus how Assad had miscalculated the realities of the 21st century by attempting to crush dissent in a country already destabilized by disastrous misrule. It would be good if ZOO would reflect on those points. MOSCOW – President Barack Obama’s warning over chemical weapons in Syria indicates the West is looking for a pretext for military intervention, a senior Syrian government official said Tuesday following talks in Moscow. Obama said Monday the U.S would reconsider its opposition to military involvement in Syria if President Bashar Assad’s regime deployed or used chemical or biological weapons. The U.S. president called a turn toward such weapons of mass destruction a “red line” for America. “Such an intervention is impossible,” Jamil told journalists in comments translated into Russian. “Those who are contemplating this evidently want to see the crisis expand beyond Syria’s borders.” The Syrian civil war, which began with a popular uprising in March 2011, already is spilling over into neighbouring Lebanon. Russia, which along with China has steadfastly backed Syria and blocked U.N. sanctions on Assad’s regime, earlier warned Syria against using such weapons. Jamil said the government would be willing to discuss Assad’s resignation but only after the opposition agreed to join in negotiating a peaceful settlement. Observer’s # 50 is necessary BUT not sufficient. Idiot prethident and his criminal henchmen must be brought to justice and must not be given any honorable exit. Time for that is long gone. The threshold of martyrs has simply become so high that the thought of forgiveness is no longer feasible. We owe it to all those martyrs who paid the ultimate sacrifice to make sure that their sacrifices are not made in vain. Justice and rule of Law is what The new Syria needs above all. Justice starts by upholding the principle of accountability. There is no higher accountability than holding the blood of the martyrs as most sacred and as not subject to compromises. If we cannot live up to that then we have failed the martyrs and failed to achieve the objectives of this great revolution. The discourse here is depressing, and even more so because, due to its very nature (English language blog), it’s supposed to cater to the more educated amongst us Syrians, and presumably, those more exposed to democracy, dialogue, etc. Scanning through these comments, it seems all critical thinking and analytical reasoning has been lost. People are polarized; most seem to have committed themselves to a position (usually extreme), and find whatever logic or piece together whatever facts to support it. The positions are juxtaposed and are mutually exclusive with virtually no room for reason or compromise. In the process, the country, and its social fabric is being systematically destroyed. The two camps are: 1. Support the regime – either due to fear of the alternative or because of interests/ideology; or 2. Bring about the end of the regime – at any cost, with total disregard to the fact that the the vast majority of the opposition has proven itself no better the regime they despise. While I have long been opposed to this regime, I’m more concerned with the long-term well-being of the country than I am about exacting retribution. In this highly consequential conflict, I think a more analytical, non-emotional and nuanced approach is needed. First, our prognosis needs a little more depth. While it’s true that the Assad/Baath regime since 1963 has delivered Syria to this terrible predicament, there is much more going on here. Notwithstanding the truth that the regime’s brutal reaction to the early demonstrations virtually dragged the country to the current civil war, the Syrian conflict, as it now, has long ceased being about Syrians, freedom, democracy, opportunity, equality, etc. though these are the legitimate hooks needed to advance a much wider geostrategic agenda. The West never cared about Syrian human rights or democracy; this is a self-evident fact that should not require much elaboration. Even more laughable are the Gulf Tribedoms where people have far fewer rights and freedoms, and whose ‘states’ have even less institutions than Syria. So, the claims of the West or the Gulfies about protecting the Syrian people rings hypocritical, at best. It also shouldn’t require much analysis to understand that this conflict is a key element of a much larger, multi-phased political, economic and eventually military ‘war’ being waged on Iran to weaken its regional power and influence. And, finally, I believe that there is a considerable energy component that is at play in this conflict as well. It’s no secret that massive gas fields have been discovered off the Israeli coast (some contested by Lebanon) as well as around Cyprus. It is thought (check USGS website) that there is much more gas to be found in the waters off the Lebanese and Syrian coasts as well. This might explain why Russia, which is the world’s largest gas exporter with a monopoly on gas supplies to Europe, as well as China with a massive and growing energy-thirsty economy, are fighting to keep Syria within their orbit. Not unrelated, the energy pipelines from Iran, Egypt and elsewhere – whether to Banyas (Syria), Tripoli (Lebanon) or Ceyhan (Turkey) all must pass through Syria. The point here is that Syria has long turned into a battlefield for larger powers trying to project their influence and improve their negotiating leverage ahead of the grand bargain that is surely coming. What this necessitates is an unemotional and sophisticated position/response by Syrians, which unfortunately has been sorely lacking. In my opinion, the regime of Bashar Assad has long fallen, in the way we’ve all known it. He’s virtually finished, and however this conflict ends, I simply cannot see a scenario in which he and his team/party survives. So, the responsibility now is to safeguard the state institutions, the cultural wealth and the fragile society, particularly because the Baath/Assads have left it so devoid of political infrastructure and, frankly, intellectual horsepower, to deal with a crisis of this magnitude. However one disagrees/detests the current (and previous) regime, any patriotic and responsible Syrian has to care about what is in store for Syria post-Assad. That a new Syria will emerge is not in question; what should be of concern is what this new Syria will look like. Unsavory and unbearable as this regime is, Syrians cannot afford to live with the outcome of bringing down the regime at any cost. Today, for the talk of a diverse opposition, the extremist Salafi fundamentalist, Wahhabi Islamists, funded by Saudi Arabia and Qatar, are on the ascent. Numbers notwithstanding, they have the financing, the weapons, the support and media support to act…and they are increasingly hijacking the agenda and the slogans. Their agenda, ideology, lexicon and even looks are alien to Syrian culture. While I supported the people who took to the streets chanting “واحد واحد واحد الشعب السوري واحد” and other similar peaceful slogans, I cannot today accept having armed Talibanish thugs with an agenda that, outside of deposing Assad, can be summarized by covering women and chopping limbs, hijack this revolution – especially knowing that these groups are doing the outsiders’ bidding, to advance a much larger agenda of ‘flipping’ Syria to a different camp, with no regard to the interests of the long-term interests of the Syrian people. So, it is with much disgust that I wish today that one of two things happen: 1. The regime puts an end to this armed and bloody rebellion, knowing that he’s finished anyway, and must relinquish/transition power willingly, or otherwise; or 2. The regime fights the rebels to a standstill. In both cases, a larger deal must be brokered that includes the US, Russia, Iran & Turkey (maybe even Saudi) that, among other larger deal terms, includes the political make-up and orientation of post-Assad Syria that, hopefully, means that the country is a client to neither the Saudis nor the Iranians, and whose wealth and future belongs to its people. Are Reports of al-Qaida in Syria Exaggerated? Intelligence reports claim that members of the al-Qaida terrorist network are streaming into Syria to join the rebel ranks. But the rebels deny the allegations and say that jihadists are not welcome. In any case, it is the Assad regime that has long had ties to al-Qaida. Some rebel checkpoints in Syria are currently flying the black flag of al-Qaida. One of the flags is attached to a stick stuck into a tire weighed down with rocks in front of a checkpoint manned by the Free Syrian Army (FSA) in Aleppo, the country’s largest city. The Islamic creed, “There is no god but God, and Muhammad is the messenger of God,” is written in Arabic on the flag. Even though it is Ramadan, the Muslim holy month of fasting, the clean-shaven men at the checkpoint offer the foreign reporter something to drink. Some do not abide by the fasting requirement. You know it’s all true when the taxi driver turns off the motorway towards Aleppo. In front lies a mile of empty road, disappearing into the heat haze on its way to one of the oldest cities in the world. But a halo of brown smoke embraces the horizon and the driver knows better than to follow the motorway signs from the airport. He turns left, gingerly bouncing over the broken median rail, then between two huge piles of rocks like a frightened cat. In front of us is a sea of burnt houses and wrecked cars, through which we drive slowly. The engine cuts out in the way my dad’s car used to in France on bad post-war petrol, the accelerator cutting out nervously as we drive past two rubbish trucks upended to form a makeshift road-block. But these are phantom check points. There are no gunmen, no militiamen, no al-Qa’ida, no “terrorists”, no “gangs”, no “foreign fighters” – how one grows sick of these eternal semantics – and not a civilian soul, because this battle is over – for now. The Syrian regime will never fall, because it will mean the fall of Syria itself. Syria al-Assad is eternal, Bashar al-Assad along with his father and brothers are eternal, they are super-human supermen, endowed with divine gifts, they are close to God incarnate itself. They are simply superhuman. They have been chosen by God personally, like he chose Mary, to rule Syria. They are the chosen ones. They in the last 40 years have taken a backward country into a major Superpower, THE most powerful Arab country ever, with the strongest Army and the most solid, growing Economy. Syrians are King among Men and Assad is the King of Kings. ALLAH SOURIA BASHAR W BASS. Assad has won, the battle is over. NOW IS THE TIME TO GO OUT AND HUNT DOWN. A State has the right to kill 1/3 of its population in order to save the 2/3. Those resposible for shelling and airstrikes that destroyed Syria’s heritage buildings and public hospitals, schools and mosques, should be tried and ordered by the court to do hard labor to rebuild what they destroyed. With the materials paid for from their confiscated estates. That would include potbellied backroom strategists and thugs who brutalized and bought their way into senior military positions. Those with brains as small and primitive as the Assad brothers, who gave the orders to destroy buildings and infrastructure owned by the people of Syria. It would probably be the first honest real work they had ever done. I can just imagine them sweating and panting and whining from the effort. Private domestic dwellings should be rebuilt in extensive public work projects funded directly from Assad stolen loot retrieved from overseas (including sale of the luxury Mayfair mansions owned by Rifaat Assad and his son). Destroyed small businesses should be compensated out of the proceeds of the public sale of businesses and assets confiscated from Rami Makhlouf. This is what he said in 1988 when that Aung San Suu Kyi tried to launch another of these failed uprisings by inciting jobless desperate oppressed youth, only for the brave Army soldiers to crush them ruthlessly. DON’T DO IT, YOU WILL COME TO REGRET IT. You will be target practice for the Syrian Arab Army. I wonder what does it take to get this fact into their thick heads ? Oh, isn’t Hassan having fun. Enjoying his cosy armchair and giggling to himself while he writes outrageous, naughty things. At least Hassan is being honest unlike…. He seems to have ditched the false and manufactured narrative. Ramadan may be over but the rebels may still be observing the recommended 6 fasts of the new month (Shawwal). There will be no let up in the fight against tyranny. ..:: || ‘Like Fasting the Entire Year’ || ::..
A report from Reuters suggests that today’s intensified clashes in Damascus are a result of rebels returning to the city. Maaz al-Shami, a member of the Damascus Media Office, a group of young opposition activists monitoring the crackdown in the capital, said rebels who had left the city during a fierce army campaign last month had started to return. “They went back to their homes, or disappeared in the green belt surrounding Damascus,” Shami said. “They are back now, and the regime is responding with daily shelling and helicopter bombardment. A war atmosphere in Damascus is setting in,” he added. Sorry, I don’t buy the ‘evil’ vs ‘good’ argument. That’s not politics that’s moral idealism. Same, it has nothing to do with DNA. Germany, France, Italy killed millions jews. Was it all about Petain, Mussolini and Hitler’s DNA? or it is the DNA or the Germans, Italians and French who chose them as their leaders? Both are oversimplifications that allow you to pursue the unique goal of removing the “apocalyptic beast” and bring back Syria to the original ‘purity’ it lost 40 years ago. In view of the way this conflict has evolved, it’s too late to hope for a “victory” of any of the sides. Both sides have lost. Both sides have bloody hands. Realism calls now for an end to the killings through compromises reached by a dialog without preconditions, and not through more escalations that only leads to more death. Moral idealism calls for reaching an elusive goal through more death and unwilling martyrdom. “Moscow however bluntly told the West not to meddle in Syria after US President Barack Obama hinted at possible military action if Damascus resorted to its chemical weapons arsenal. “Accession into international institutions such as the WTO lends Russia the credibility it needs to shore up the country’s investment environment,” it said in a special report. Iran calls Turkey to mind its own business in the aftermath of the Gaziantep bombing whose responsibility was denied by the PKK. Nakavi also alleged that Turkey was supporting terrorist organizations like al-Qaeda in Syria. The official has taken aim at Turkey before, alleging that the June 22 crash of a Turkish warplane off the coast of Syria was the result of a “conspiracy” that was plotted by Ankara so as to drag NATO into a conflagration in Syria. The SNC using the word “negotiate” for the first time in 18 months while still ‘studying’ the elusive “transition government”. Will Sayda deny what Ghaliun said? PARIS, Aug. 21 (Xinhua) — A senior member of the opposition Syrian National Council (SNC) said here Tuesday that the opposition umbrella group was ready to negotiate the departure of President Bashar al-Assad and his allies. “We are ready to negotiate the departure of all those who made suffering the people with massacres during 17 months. We negotiate their departure but not … arrangements,” Burhan Ghalioun, vice president of SNC told BFMTV news channel. “This is a process that requires a lot of consultations, do not go too fast but the Syrian National Council is trying to achieve it as soon as possible,” he noted. The magic number 70%… Did Ryad Hijab misunderstood whose 70% it was? The newly appointed United Nations-Arab League peace envoy to Syria, Lakhdar Brahimi, is expected to travel to New York this week to officially take office, succeeding Kofi Annan, who gave up such a “difficult, if not impossible mission” in disgust, the London-based newspaper Al Quds Al Arabi stated in its lead editorial yesterday. Mr Brahimi, a seasoned diplomat from Algeria, suggested in a statement to the media that it was still too early to comment on whether President Bashar Al Assad should step down. The National Syrian Council demanded that Mr Brahimi apologise for his comments “which seem to give President Al Assad … a licence to kill tens of thousands more”. The Syrian regime also denounced Mr Brahimi’s comments as interference in Syria’s internal affairs. If diplomacy is the art of saying the right thing at the right time – which Mr Brahimi, 78, certainly knows – that art might not be so easy to pull off, given the complexity of the Syrian crisis, the paper concluded. Your answer does not dispute what I said. In fact the comparisons with vicious dictators Hitler and Mussolini, who fought irrationally and delusionally until death, support my comment on Assad. In other words, after all the atrocities and burning and looting the country, the magic deal for discussion would be that Assad and his gang be allowed to continue in power doing what they have always done? Zoo, I can’t grasp your concept of “reality” and “realism” in this situation. And worse, it appears you are far from accepting – or comprehending – what has actually happened inside Syria. Still, it’s interesting to get an idea of your thinking. My cousins just arrived from damascus. They came with little revolution flags. I have been speaking with a lot of christians families that recently moved to montreal and the majority are completely against the regime. In Syria, they keep appearances and nod along with their alawites friends but it’s just a facade. The regime is truly delusional is they think christians will fight for their cause. I think you lack realism when you ask for negotiations without pre conditions while the gun remains in the hand of the regime pointed at the heart of the people. The REALITY is that this is a mafiosi regime to the core based on a clan of inner circle thugs and thieves surrounded by cronies and profiteers and hiding behind a masquerade of so called resistance. The resistance B.S. with which we are being massacred daily with weapons that are supposed to liberate the land and the citizen. I do not know in what universe you live. If like the regime you are trying to resurrect the dead Hafez you are completely delusional and need serious help. Now which one of you will be willing to join me on a Medecins Sans Frontieres mission to Syria? This is verbatim from Juan Cole blog and he is no fan of US interventions and imperial superpower politics and double standar BS from the West against the Rest. Admittedly, the Baathist government of Bashar al-Assad could go on faltering for a long time. And it is very hard to know what is going on inside Syria, since few journalists are allowed in and those who sneak in are operating under very diificult conditions and are sometimes killed by the regime, whether deliberately or not. But there are some signs that the Baath is on its way out. The deputy prime minister, Qadri Jamil, said Wednesday in Moscow that the regime is ready to talk to the opposition. That sort of talk is a sign of weakness, and that it comes in Moscow suggests panic in the Kremlin about the inability of its client to prevail by sheer brute force. Russia, the BBC says, will put forward a road map for resolution of the crisis that will end in presidential elections. The revolutionaries are demanding that al-Assad step down before they will join talks. Jamil says an al-Assad resignation could be discussed, but not as a prerequisite for talks. Unfortunately for Russia, President Vladimmir Putin’s own conduct of elections would not exactly give the Syrian revolutionaries hope. When your main patron is suggesting you’ll have to compete for your own job and your deputy prime minister is saying your resignation can be discussed with revolutionaries, it just isn’t a good sign for any president for life.